On April 25, I note without celebration the anniversary of the birth of Oliver Cromwell: squire, soldier-statesman, and slayer of civilians. During the wars of the 1640s Cromwell ordered the slaughter of innocents in Ireland, an abomination that not even the most ardent of Roundheads (of which I am one) should attempt to rationalize or excuse. So, mindful of the aphorism attributed to Fritz Perls regarding the fimetic quality of everything that precedes the word “but,” I now have to explain why the birthday of this bloody man is worthy of note in the relatively pancytopenic field of legislative drafting. My reason has to do with Cromwell’s belief that writing should be simple, a principle I flouted in the preceding sentence by using “fimetic” and “pancytopenic,” words that are not exactly in everyday parlance. My word choice would have annoyed Old Noll, as his adoring public called him. As Lord Protector, Cromwell appointed a law-reform committee and charged it with making the laws “plain, short, and easy.” This was one of the achievements he announced in his speech to Parliament on September 12, 1654, in which he urged the honorable members to adopt the Instrument of Government, which would make him life-long Lord Protector. Standing in a room full of politicians and referring to the establishment of a committee as an accomplishment deserving of reward is evidence that Cromwell knew his audience. [F]or men to entitle themselves to be the only men to govern nations and rule kingdoms and give laws to the world, to determine of property and liberty and everything else, needs a great manifestation of God’s presence before wise men will submit to it. 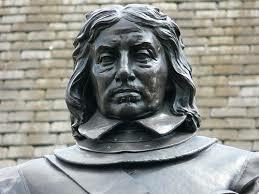 The Members of Parliament took Cromwell at his word and debated the proposal. However, when their search for a great manifestation of God’s presence took rather longer than he had anticipated, fellow-servant Cromwell sent four companies of the Scots Guards to summon them into his presence in the Painted Chamber at Westminster Palace. There he explained to the representatives of the people that their unanimous endorsement of the Instrument of Government in the “spirit of union and concord” really was the “best expedient and pilot to conduct them to the Haven of Happiness.” Surrounded by men bearing muskets, swords, and pikestaffs, a majority of the parliamentarians suddenly discovered the elusive manifestation of Divine approval they had been looking for, and voted aye. Just to be on the safe side, the following morning Cromwell locked the doors to Parliament and took possession of the ceremonial mace, so as to put an end to what the official report of the speech and its aftermath called “these distractions.” Historians differ as to whether it is reasonable to describe the ensuing period (which entailed carving the country into military districts to facilitate the rule of the major-generals, a vigorous campaign against immorality, the ejection of dissident preachers, and the imposition of a decimation tax on Cromwell’s royalist opponents) as a Haven of Happiness. What lesson does this episode offer to aspiring legislative drafters? Simply this: If promises of plain, short, and easy statutes do not prove persuasive, send in the army. But students thinking of enrolling in my one-credit Legislative Drafting course next semester should note that due to time constraints and lack of resources (the ROTC commandant has not returned my calls) we will not be exploring said option in much depth. Instead we shall look at less controversial approaches to lawmaking, such as this.